For those kids and teens who've always got their eyes on the latest trends, Zonderkidz has a something special just for them. 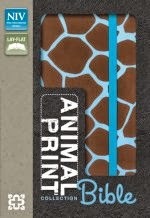 The new ANIMAL-PRINT COLLECTION BIBLES, NIV (Zonderkidz; $24.99 each September 2013) are the perfect accessories to go along with cutting-edge boots, bags and other swank items. Available in Zebra/Pink, Leopard/Pink, and Giraffe Aqua covers, the Bibles are a great option for fashionistas who are the hunt for something new to flaunt at school. My 9 year old daughter is a huge Zebra fan and I was so thrilled to find this Bible for her. It is the perfect size for her to carry to church and to use as her morning devotions. My 6 year old son loves Giraffes so I think I will have to purchase that one for his upcoming birthday. These Bibles are really pretty and emphasize the beauty of the animals God has created! 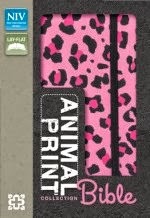 The ANIMAL PRINT-COLLECTION BIBLES, NIV offer more than their eye-catching, colorful and sleek Italian Duo-Tone™ covers. Each has the complete text of the New International Version of the Holy Bible. Small enough to fit in any backpack, they also come with handy elastic closures and a convenient ribbon marker for easy reading. For readers ages 8 and up, the trendy ANIMAL-PRINT COLLECTION BIBLE, NIV is a great way to encourage kids to read the Daily Word. The contemporary designs will give them even more reasons to tote the Bible with them to school, the mall, or wherever they go!